Yes, you read it right, Part #1! I have taken on many a challenging DIY project in my life but this one was the largest and definitely warrants multiple BLOG posts! SO, that being said, here is Phase #1! 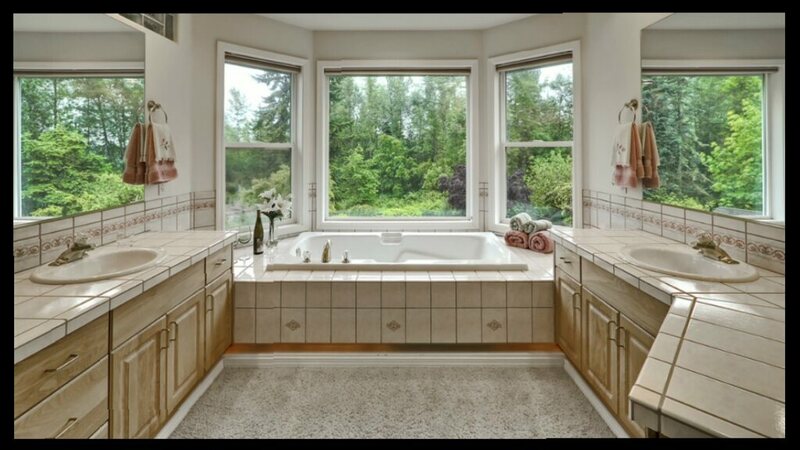 I am lucky enough to have a HUGE master bath but what I really have is a Master Bath that time warped back to 1991! Awww, yes…to say it’s “Dated” is an understatement. Example…. Check out this BEFORE picture. Note the peach colored ceramic tile with lovely burgundy and grey floral accents. Complimented with an especially painful dark tan grout. 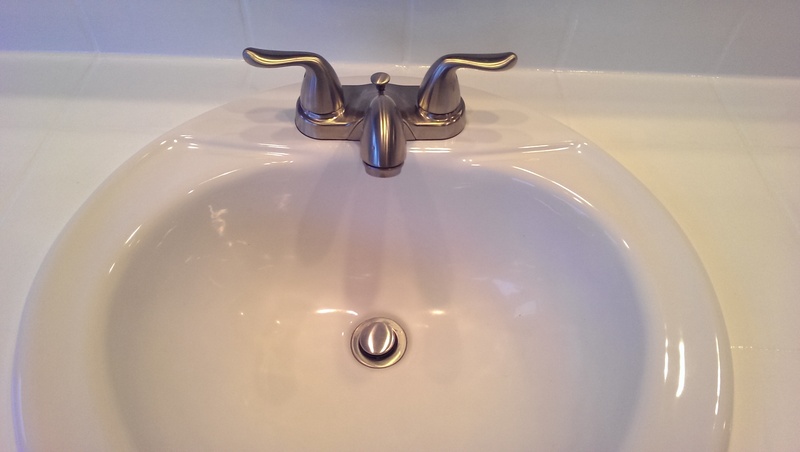 To top it off… the Brass fixtures! So much GOLD! I researched for about a month, greedily reading every BLOG and DIY post I could find on how to give an U.G.L.Y bathroom a much needed facelift. I kept coming back to the same few and realized that these brave DIY pioneers forged on through the fumes, the pain and the uncertainty to find bathroom beautification. Their pain has not gone unnoticed, it gave me the naïve confidence to embark on what I am about to show you! Tile, I’ve got A LOT of tile, two Vanities, a Roman Tub with a tile surround and a BIG walk-in shower. I knew this was going to be a massive undertaking but I couldn’t live with the peach, not one second longer! I researched the few products out there that claim to do this. After you read the reviews…you learn there really aren’t that many with decent enough reviews to be contenders. This product has steps for a very detailed prep cleaning but after reading the other DIY Warrior’s stories I chose to follow their prep plan. Let me start by saying you will NEVER have cleaned more at one time! I will say this MANY times but it is true and I can’t say it enough…IT IS WORTH IT! 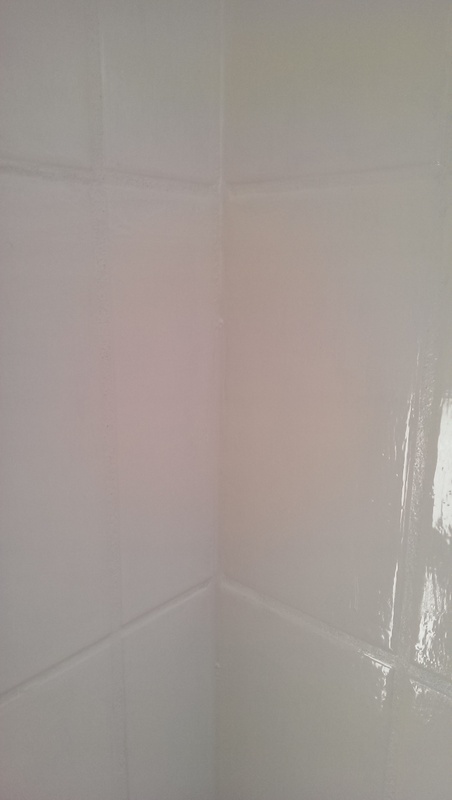 Spray your tile with the bleach solution and let stand for 10 minutes. Wipe down and then rinse thoroughly with clean water. You do not want to combine any bleach with the next step. Spray everything down with the LimeAway to remove any tough soap scum and build up. Let this stand for 10 minutes and then rinse thoroughly with clean water. With your Steel Wool apply a fairly thick coat of soft scrub to your tile and Scrub, Scrub, Scrub in a circular motion. Not only does this get rid of any remaining dirt but it also helps to roughen up your tile so that the Epoxy will adhere well. Rinse VERY well with clean water. 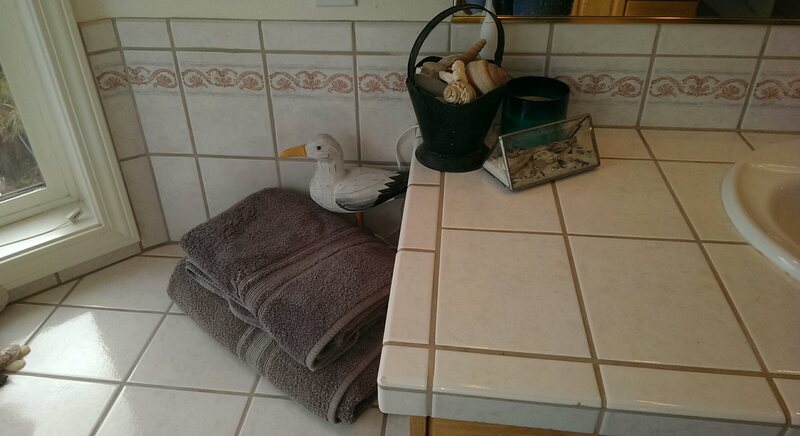 You want nothing left but clean sparkling tile and grout! 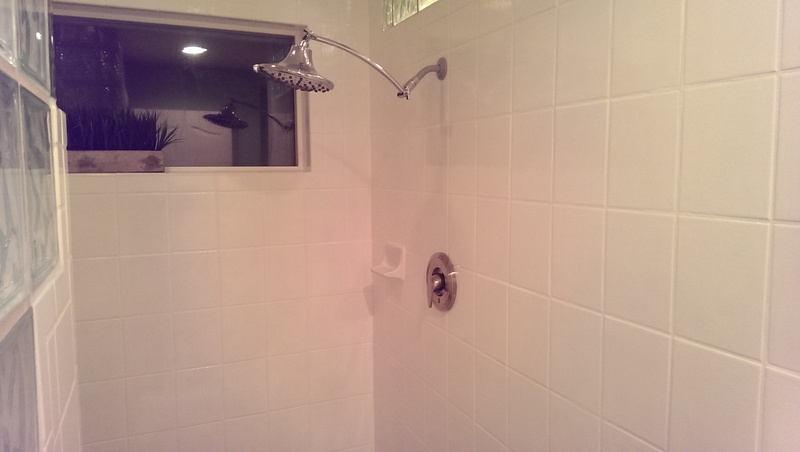 From this point forward avoid touching the tile with anything that could leave residue. Keep your gloves on so that the oils from your skin don’t get on your SUPER clean tile! Note the mask I am wearing. This is WRONG! I learned the hard way that this ToughTile is TOUGH alright! Tough to smell and tough to breathe in! This is the correct mask! 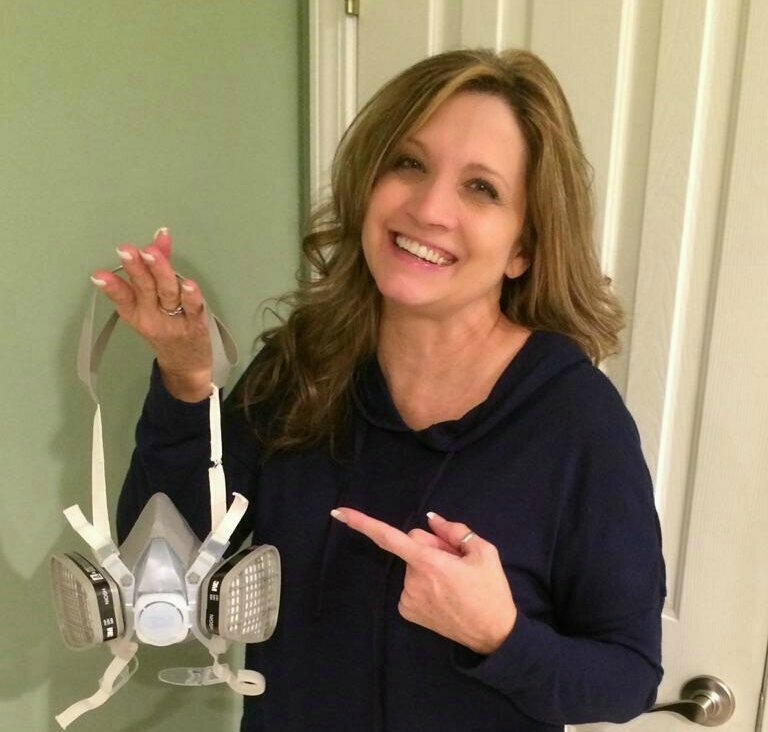 I cannot emphasize enough the importance of having THIS type of mask! The fumes in this product are..quite shocking! I thought I was a tougher than normal girl but the fumes are strikingly strong! From this point you can follow the direction that came with the product on the best way to apply the Epoxy. My advice to you is that I was too frugal on my first coat, I could and should have done it thicker. It is truly self leveling (Awesome!) as advertised. This is the picture of my first coat, note how thin it is. You could be a little more generous and be safe. 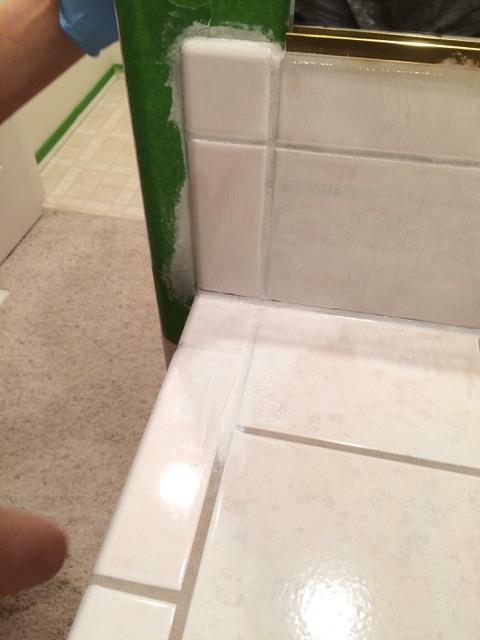 I was covering up a darker tile and grout so depending on your current color you can play it by ear. Once your first coat is in place the hard part begins…PATIENCE. I hate waiting and literally “Watching paint dry” is painful for me! ** Note, do not make the mistake I made! I started my project later in the evening then realized that the second coat has to be applied within 3 to 4 hours of the first coat. What that meant to me is that I was starting my second coat at midnight! Ugghh!! I added a small space heater and a normal box fan to the space, closed the door and waited impatiently for 72 painfully LONG hours! DING, DING…Time is up! YIPPEE!! I applied the third coat and that made all the difference in the World! Now 72 more hours…..UGGHH! Love the look after the 3rd coat! WOW is it bright in here now! Almost done! No, the fine tuning to ensure perfection! You may see some tile lines and grout that look like this. I had a few spots like this and they were an easy fix. I could have left them but why? I had already invested so much time and I really wanted to make my DIY project as perfect as possible. I grabbed a tube of Supreme Paintable Silicone Waterproof Caulking and my handy dandy Caulk Gun and went to work! The Devil is in the details. This not only looks more finished but will help to ensure that moisture stays out. Just a sneak peak of the end result to the “Tile Project”. I don’t want to give too much away before the final reveal. I am thrilled at the total transformation simply changing the tile made. It is so clean and pretty! I can’t wait to show you the rest so watch for my next installment!